awning care and cleaning Archives - Delray Awning, Inc. Your local custom awning manufacturer. Hose down the awning regularly and allow to dry completely so dirt will not accumulate on the awning. Brush the underside of awning regularly with a household broom to remove any spider webs or insects. Do not allow twigs, leaves or other organic debris to remain on awning fabric. Keep shrubs, vines and trees trimmed to avoid matter getting onto fabric. Do not over spray fabric with insect repellants, as some insecticides will stain. Do not pressure clean the awning fabric. It will invalidate our fabric warranty. It may or will damage the cover, heat sealed or sewn seams and stitching. If you are going to clean your awning fabric, wet ropes and binding first with plain water, then use a soapy solution and a light abrasive brush. You will need to add a small amount of laundry bleach to the solution if there is mildew. Rinse thoroughly and allow to air-dry. It is critical to make sure you rinse it thoroughly to remove all bleach and solution as ropes absorb cleaning solutions, which can lead to frame corrosion. An awning cleaning service is available thru our office. Call 561-276-5381 to obtain information. For products with Sunbrella® fabric please follow their cleaning tips below. One of the best ways to keep Sunbrella fabrics looking good and to delay deep or vigorous cleaning is to maintain the fabrics correctly. This can be accomplished by simply brushing off dirt before it becomes embedded in the fabrics, wiping up spills as soon as they occur or spot cleaning soon after stains occur. Sunbrella fabrics do not promote mildew growth. However, mildew may grow on dirt and other foreign substances that are not removed from the fabric. Prepare a solution of 1 cup of bleach and 1/4 cup mild soap per gallon of clean water. Clean with soft bristle brush. (Note: This step should be avoided when cleaning the coated side (Back side) of Sunbrella Plus, Supreme, or Clarity. Re-treatment of fabric for water and stain resistance will be necessary after using bleach solution. As part of the finishing process, Sunbrella fabrics are treated with a fluorocarbon finish, which enhances water repellency. This finish is designed to last for several years, but must be replenished after a thorough cleaning. Based on test results, Glen Raven® recommends 303® Fabric Guard™ as the preferred re-treatment product for Sunbrella fabrics. Fabrics should be re-treated after thorough cleaning or as needed. For more information on re-treatment products, please visit www.303products.com. Apply 303 Fabric Guard in a well ventilated area following instructions on the container. Apply 303 in a thin, even coat and allow fabric to dry completely. Note: A 16-ounce bottle provides coverage of up to 75-100 square feet of fabric depending on material and application method. – bleach may discolor non-Sunbrella fabrics. 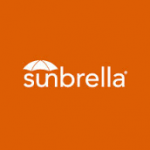 Always rinse Sunbrella thoroughly to remove bleach completely. Please be aware of the environment when cleaning with bleach. Bleach can have harmful effects on the natural environment around you. We do not advise using bleach if you are surrounded by a body of water or other environments that could be affected. If the fabric has some wrinkling, use an iron, if necessary, but only on the synthetic setting. As some irons exceed the recommended temperature on the synthetic setting, test a small inconspicuous area before ironing entire piece. DO NOT use a steamer or iron set to steam setting! Use of bleach on advanced aged fabric applications may impact the deterioration of the sewing thread and other non-Sunbrella components. Let our craftsmen create a custom fabric awning to fit your home or business. We make Awnings, Canopies, Cabanas, Outdoor Window & Door Treatments, Storefronts, Entrance & Walkway Coverings and more... We are your designated dependable fabric covering shop. Call For Appointment, Free Quotes! Click to learn more about motorized retractable sun shades and motorized retractable awnings. Copyright © 2019 Delray Awning Company, All Rights Reserved.